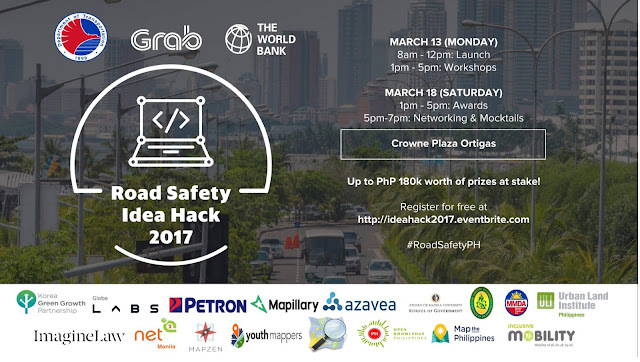 Home / dotr / grab / hack / mobile app / DOTr together with Grab launch Road Safety Idea Hack event. DOTr together with Grab launch Road Safety Idea Hack event. The Department of Transportation (DOTr) and partner agencies gather Filipino developers, IT and digital media talents, and road safety enthusiasts in a national Road Safety Idea Hack, which also featured workshops using traffic and road safety data sets at the Crowne Plaza on March 13 and 18.
and other datasets, such as jeepney routes and school locations. Participants can do hacks in their own, instead of a 2-3 day hacking on one area, the participating teams are allowed to do their task on their own places, as long as they can submit the needed requirements on or before 6PM of March 17. Entries will be judged according to expected impact, creativity, feasibility, and presentation. Alongside with the hacking event announcement, the DOTr also introduced a new platform called Data for Road Incident Visualization Evaluation and Reporting (DRIVER), a web-based and open-source national system for geo-spatially that record and analyze road crashes. DRIVER can be access at www.roadsafety.gov.ph and is currently populated with data from Metro Manila, Cebu, and Dipolog.